Hard shell plastic design lasts through long-term use. (2) front wheels make heavy loads portable. 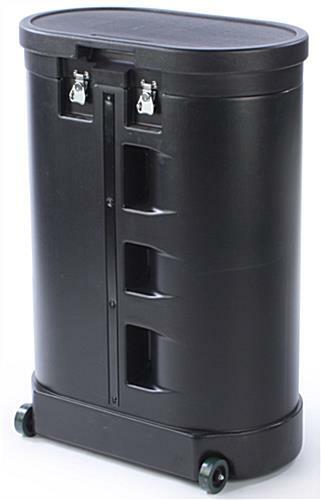 Twist-around latches securely fasten to keep accessories protected. 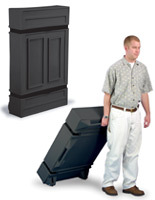 39" tall case can act as a counter during a trade show presentation. Separate storage area keeps spotlights protected. *Not suitable for use as a shipping container. 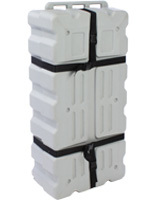 This hard carrying case can be used to transport trade show accessories to and from an event. 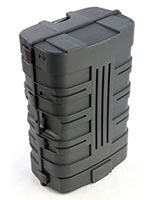 The portable container, hard carrying case is made from a hard plastic to keep your accessories protected. 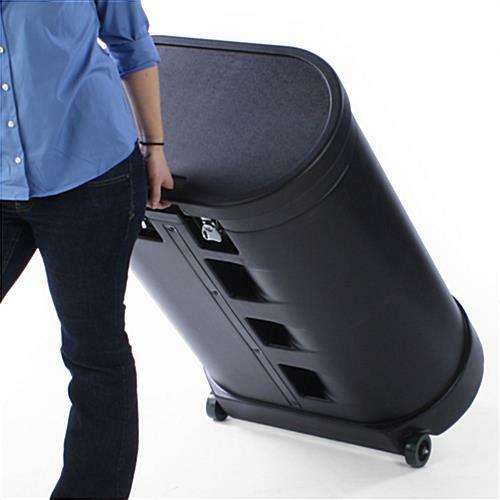 This hard carrying case was designed more for storage and shorter trips, and therefore should not be used to ship trade show products anywhere. 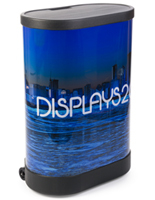 The hard carrying case features a simple plastic, hard shell design, therefore making it perfect to store large banner graphics or knockdown display fixtures. 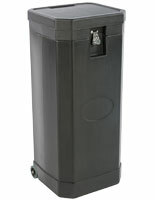 The hard carrying case is equipped with (2) front wheels, making it portable, even when completely filled. 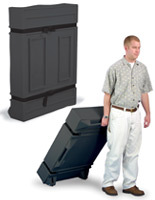 This hard shell container, hard carrying case also includes high-quality latches to keep its cover securely attached. The latches, with their twist-around design, even feature an area for attaching a lock! 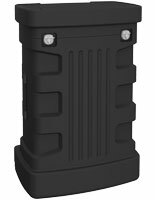 This hard carrying case makes it extremely easy to transport your trade show accessories and exhibits in between events. 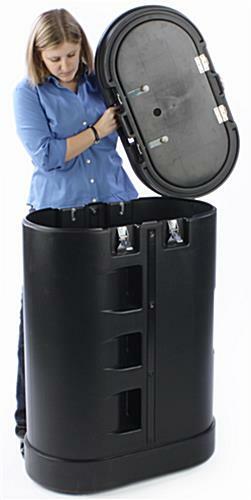 The hard carrying case even includes a separate storage compartment for more fragile items, such as spotlights. 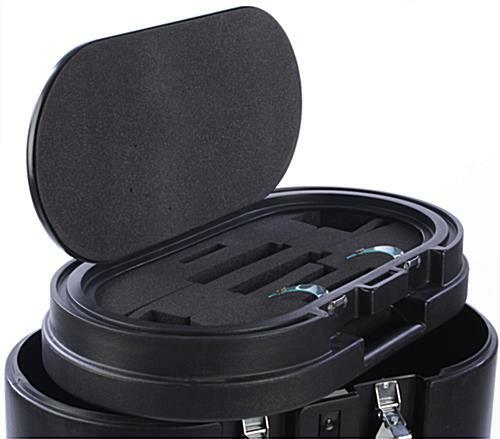 Buy the hard carrying case to make your presentational equipment more portable and easier to store. 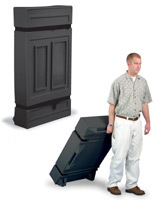 The hard carrying case can even be used as a counter during a presentation! Please note: This case is intended for storage and is not suitable as a shipping container. The interior dimensions have 6 decorative divots. So, the interior depth at its smallest point between the divots is 8.75" and without divots is 12.5". 27.8" x 39.0" x 16.0"
25.8" x 33.0" x 12.5"
I shipped this booth once and it cracked in multiple places. This booth case is not strong enough for shipping, which is really sad because that is what I bought it for. I was using this case to ship a booth I previously bought from Displays2go (unfortunately the original case for that booth is not sold separately -TRUSLCDPULGG). This is very disappointing that there isn't a replacement product that is durable for this. I am very dissatisfied with this purchase. We're so sorry to hear that you've experienced this with your case, Courtney and would love the chance to help you find a better solution that works for your needs. A customer care specialist will be following up to assist with this and turn your experience around. We have also passed this feedback along to our product team for immediate review. Thank you for sharing this feedback, it helps us to identify problems and continuously improve our process. We appreciate that immensely. The product meets our requirements for functionality. The order/purchase and delivery processes were flawless. Thanks for the great review, Alan! We hope you shop with us again soon! This case is great! I was worried that my display would not fit because it is pretty big but I fit the display and more! My favorite part is the top where the lights are stored. It would be better and easier to roll around if it had bigger wheels but I am still happy with this purchase. Much better than last time. I bought this same item a year ago and it was awful. The lid didn't fit well, one of the latches wouldn't turn, and the clasps on the lid that the latches lock into were weak and only affixed with 2 rivets, and the quality of plastic seemed poor. The first show we sent it to (via UPS), it showed up in pieces. So we were reluctant to order again, but we needed a case. The price was more than it was a year ago, but the quality appears to be MUCH better. the lid fits, the clasps and latches feel stronger, there are 3 rivets per clasp and the plastic looks and feels better.So we are hoping to get a little more out of this case than the last. Hi Tim, We are so glad you gave us another chance and we met your expectations! We hope we are able to work together again soon! This crate is not sturdy enough for shipping for trade shows. The one I ordered cracked after a few shipments. I wouldn't recommend it for frequent shipping. We are very sorry that you were not happy with the quality of this product, Hilary. A customer service representative will reach out to you promptly to address your issue.